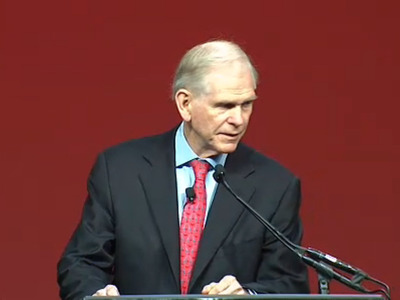 You could argue that Jeremy Grantham is bullish. In a new quarterly letter to GMO clients, the gloomy veteran fund manager predicts the S&P 500 could see another 10% surge from the 2,041 level we’re at today. “My personal fond hope and expectation is still for a market that runs deep into bubble territory (which starts… at 2250 on the S&P 500 on our data) before crashing as it always does,” he wrote. We should remind you that exactly a year ago when the S&P 500 was at around 1,790, Grantham made a medium-term prediction that the market could see gains of 20% to 30% in one to two years. That call was actually more bullish than the typically bullish forecasts of Wall Street’s sell-side strategists. So far, the market is almost perfectly tracking Grantham’s prediction, which only makes us more nervous about his calls for a crash. GMO’s Ben Inker offers a Hell scenario in which investors are rewarded a bit more over the next seven years as savers get punished. 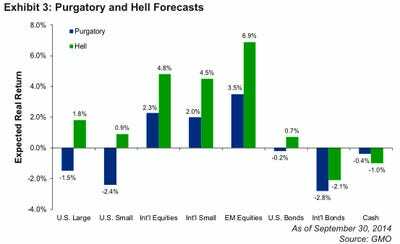 Still, both the Hell and Purgatory scenarios mean unusually low average annual returns for many years to come. Regular readers know the score: +2.5% a month for the seven months from October 1 to April 30, in year three on average since 1932 (a total of +17%). This is now the 21st cycle. The odds of drawing 20 random 7-month returns this strong are just over 1 in 200 according to our 10 million trials. But 17 of the actual 20 historical experiences were up and the worst of the 3 downs was only -6.4%, so the odds of this consistency plus the high return would be much smaller. The remaining 5 months of the Presidential year have a good but not remarkable record, over .75% per month, but the killer here is that the remaining 36 months since 1932 averaged a measly +0.2% a month! Grantham warns that this time is different with negatives including the ending of the Fed’s bond purchase program, the prospect of soon-than-expected rate hikes, the escalation of geopolitical turmoil, and the ongoing threat of the Ebola virus spreading. We’ve already seen the S&P fall over 9% from September 19 to October 15 on those same fears before roaring back to new all-time highs.